Crystal Light Sugar Free "On The Go". 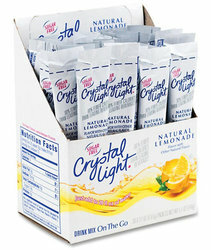 These tasty little packs make a full glass of Crystal Light, just add cold water! And best of all, they are only 5 calories AND sugar free. Economical and convenient. Atkins Friendly, Weight Watchers Friendly, Sugar Busters Friendly, and just plain GOOD.